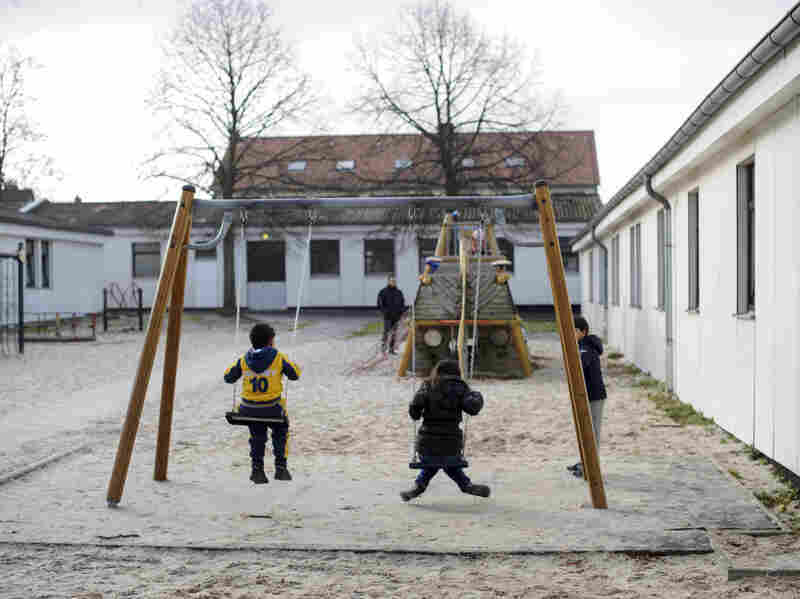 Despite Dim Prospects, Syrian Exodus To Germany Continues : Parallels Germany is one of the few EU countries that has welcomed Syrians fleeing civil war. But it offers refuge only to a few thousand out of the millions who need it. And it actually deported Syrian asylum-seekers last year because of treaty requirements. Still, Syrians are risking their lives to get there. 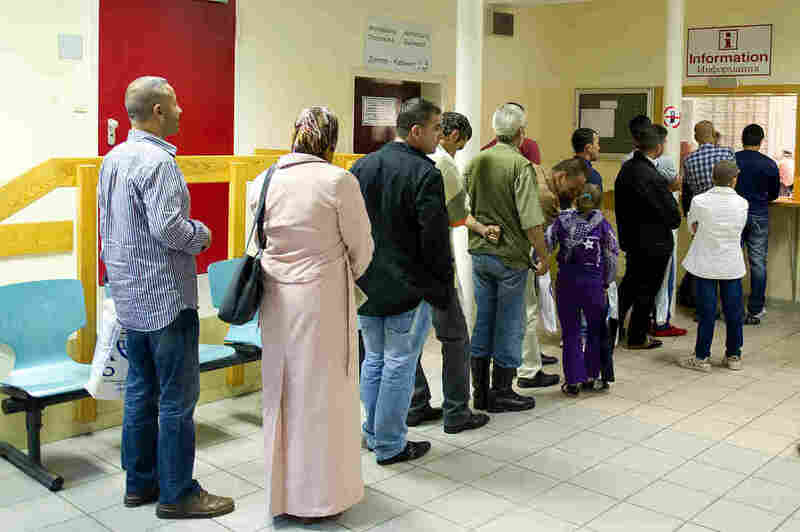 Syrian refugees arriving at the transit camp in Friedland, Germany, stand in line at the registration desk on Sept. 11. Germany has deported asylum seekers on the basis of an EU treaty that requires migrants seeking entry to Europe to be processed by the first EU country they arrive in. Many Syrians in Germany have come from other countries such as Bulgaria or Greece. Human rights officials say the Syrian civil war is creating Europe's biggest refugee crisis in decades, but that countries across the continent are doing little about it. Most European nations are refusing to take in Syrian refugees, choosing instead to send money to the United Nations and other international agencies. The few EU countries like Germany that are welcoming Syrians only offer refuge to a few thousand out of the more than 2 million Syrians who have fled their homeland. But the cool reception isn't stopping Syrians from risking their lives to get to Europe. There are many smiling faces at the Friedland transit camp in the German state of Lower Saxony. There, Syrian refugee children play outside pristine barracks on a warm winter day. A few Syrian men unwind nearby with an informal game of soccer. One of those kicking the ball around is 23-year-old Ibrahim. The sports teacher, who doesn't want to give his last name, says he spent everything he had and borrowed a lot more to pay smugglers $7,000 to get him here from the Syrian capital Damascus. He says he traveled by boat from Turkey to Greece, where the police beat him and other refugees. Ibrahim got away. He says he later traveled by train from Italy to the German city of Dortmund, where he turned himself in to police and asked for asylum. Like many at the camp, Ibrahim is relieved to be among the lucky few who made it to Germany. And like them, he fears his luck will turn and that he'll be sent back to Syria. Syrian refugees play on the swings in the playground at the Friedland refugee center on Dec. 10. "We hear a lot of good things about Germany and how they treat refugees. I'd like to work here and continue my university studies," Ibrahim says. "But of course I'm worried they are going to kick me out." His concern is understandable. Germany is one of 14 European countries that deported dozens of Syrian asylum seekers last year. Officials say that's because of a treaty that requires migrants seeking entry to Europe to be processed by the first EU country they arrive in. Most of them ended up in Bulgaria, which lacks the means to handle the influx and is widely accused of mistreating Syrian refugees. UNHCR, the U.N. refugee agency in Geneva, is one of a growing number of groups calling on European governments to stop deporting refugees, even if they arrive illegally. "What we want here is for Europe to ensure that those Syrians who are fleeing persecution, fleeing the desperate situation and the war in Syria, are given the protection that they need," says Dan McNorton, a UNHCR spokesman. Back at the German camp, even Syrians who came here legally through programs managed by the U.N. express fear about being sent back. Kassm al-Kady is one of them. He arrived from Beirut the night before with his wife and four of his children on a chartered plane with other Syrian refugees. The packed planes are coming to Germany every other week. He says he was told in Beirut that his family would be allowed to stay in Germany for two years, but had to agree to leave earlier if asked by German authorities to do so. The 58-year-old engineer says he and his family try not to dwell on fear and are focusing instead on their new life. That life begins here at Friedland, where refugees take German language classes. They also receive meals and medical care, as well as a small allowance they use to shop in the local village. The camp was originally set up by British Allied forces at the end of World War II to deal with German refugees and prisoners of war returning from Eastern Europe. Since then, it's handled hundreds of thousands of refugees from subsequent wars, including in the Balkans, Iraq and Afghanistan. Camp coordinator Heinrich Hoernschemeyer says Friedland is currently home to 500 refugees from 10 countries, the largest group being Syrian. About half of the 10,000 Syrian refugees Germany has agreed to resettle will pass through Friedland. Hoernschemeyer says that number is not enough. He likens it to trying to cool a hot stone with a single drop of water. "My parents experienced war, and there were many Germans at the time who were happy to find refuge in other countries," he says. "We should remember that."